In today’s hyper-competitive business world, only decisions that are backed by data can be trusted to bring the desired results. But in order to gain valuable insights from their data, companies must first understand it, and that’s very difficult if you aren’t able to visualize the data in a way that makes it easy to understand. That’s where business intelligence software and data visualization tools come in. So, what are visualization tools? Leading decision makers put an emphasis on making data visualization a part of their decision-making process. Charts, infographics, heat maps, videos and even augmented reality presentations can all be incredibly effective at engaging viewers and making data easier to understand. 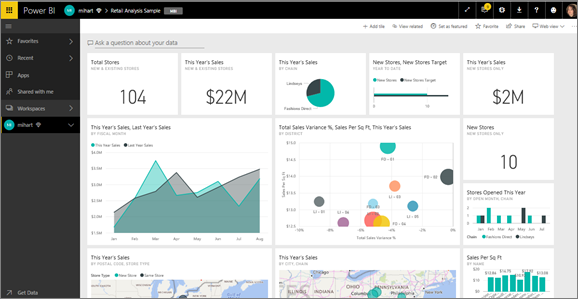 This article will break down the basics of business intelligence tools and data visualization. Then it will explain why it’s crucial in the modern business world and offer some of the best visualization tools to help you on your way. Why is Data Visualization so Important? The answer lies in the way that we process information. Our brains are wired in a way that requires visual triggers in order to truly immerse itself in what it’s experiencing. In other words, it’s much easier to understand something when looking at a graphic than it would be when sorting through never-ending spreadsheets, even though it contains the exact same information. Data visualization helps transform data such as trends and insights in a visual manner, which can completely change the impact of the same information when presented numerically. The Encyclopedia of Human-Computer Interaction does a great job of explaining the reasoning behind this. Data visualization works so well because our brains are much quicker at processing perceptive information (sight) than cognitive information (thought). When we see information in a format that’s immediately clear to us, such as a pie chart, our brain doesn’t have to waste energy trying to understand how the data is structured. Instead, it can focus solely on the actual information that is presented. When big data visualization tools are combined with an understanding of the principles of human visual perception, companies can experiment with different ways to present the information in order to make it easier for viewers to detect structure and patterns in the data. Making data easy to understand is the core of BI programs. While quickly analyzing data doesn’t come naturally for many people, a data visualization tool can present it in a way that enables almost anyone to quickly absorb it, helping them make more informed decisions as a result. Usually, data visualization software is a feature of BI tools, which come with extensive data visualization features that allow you to view the data in several different ways. No matter what needs to be displayed, there are always options to present it conveniently. An added benefit of BI software data visualizations is they can help improve interactions with people outside of the company, such as partner companies, vendors, investors or prospective clients. Presenting vital information in an easy-to-digest manner makes your presentations more compelling. Data visualization software is used by a growing number of companies. According to a recent study by Forbes, only 30.6 percent of companies across industries have a BI adoption or penetration rate of 41 percent or greater. However, this number is only set to increase. In a study by Zion, the global BI market will be worth $26.5 billion by 2021. To get ahead of the curve, check out our recommendations for increasing BI adoption in your company. The main purpose of data visualization programs is to make the presented information easy to understand, even for people who aren’t used to analyzing data or who are less tech-savvy in general. Luckily, there are different types of BI software solutions that can turn raw data into easy-to-digest visuals. But in order to make the most out of the software tools available, you must first understand the key features behind them. In order to make the most out of graphical data, the dashboard of the software must be easy to customize to fit the needs of the situation or the individual that’s using it. While the decision makers of the company might need a dashboard that provides a bigger picture of the entire business in order to make quick and accurate decisions, the sales department might need a more specialized dashboard visualization that displays the key metrics that are relevant to them. In most leading business intelligence software solutions, dashboard customization is a very intuitive and simple process that doesn’t take up a lot of time. It’s very easy to arrange the data in a way that’s convenient, removing or adding metrics according to your real-time needs, providing the most relevant information instantly. This minimizes the time it takes to react to any internal or external issues that need a quick resolution. Reports are another essential part of business intelligence that’s made very easy using the visual analytics and BI visualization tools available as part of BI software. Decision makers of your company can pull together data from several different data sources and compile them into reports that are easy to digest quickly with the help of visual aids such as charts or graphs. These reports can be arranged in countless different ways, such as highlighting essential parts, sorting the information in seconds or filtering it to display only the most relevant components. They can also be customized to report on industry-specific KPIs to offer detailed information for your organization. The best part about interactive visualizations is the ability to instantly add and remove data and the way it’s displayed, sorting through it until you find the answers you’re looking for. Location intelligence makes it easy to visualize and map out data that requires geographical formats. There are endless possibilities for displaying geospatial elements that allow companies to gain a deeper understanding of performance in a regional context via interactive maps. Some of the most useful functionality of location intelligence is the option to layer sets of data spatially and chronologically, which enable businesses to draw insights about location-based metrics that would be difficult to obtain otherwise. One of the most notable benefits of location intelligence insights is the possibility to determine the most optimal locations for operating a business based on previous data. Advanced analytics strategies can also explore the general business ecosystem in certain areas based on influences such as cost of living, crime, economic climate, culture, education levels and many other factors. Data mining has completely changed the way businesses analyze information. If you’re not familiar, data mining is the process of discovering patterns and trends in Big Data sets with the help of self-service BI technology. Before data mining, the sheer amount of data that larger companies had at their disposal made it impossible to analyze manually, which meant that it was basically unusable. Today, with the help of data mining, companies can analyze large amounts of pre-existing data, extracting information quickly and efficiently. This allows you to make intelligent predictions about future trends that enable companies to understand the data behind their performance. But as you can imagine, just analyzing the data with business intelligence tools isn’t enough. It’s just as important to be able to effectively summarize the data in an easy-to-understand format and identify the most important patterns that need to be understood in order to make the right adjustments. This is where data visualizations can be helpful. They can distill all the findings of data mining into convenient chart- and graph-based reports. These can then be quickly analyzed, enabling decision makers to make any necessary changes before problems arise. Today, BI visualisation tools must not only be able to provide convenient ways to present relevant time-series and real-time data, but also display that data on any device. A big part of the decision-making process now happens on the go. Therefore, in order to be effective, BI software solutions must come with data visualization options that can easily be displayed and understood on any device. Checking your data on a laptop, tablet or even a phone should be just as easy as pressing a few buttons, ensuring that the decision makers of the company have all the necessary information, no matter where they are at that moment. Luckily, most of the leading solutions available today offer mobile-friendly business intelligence data visualization tools that can be quickly accessed at any time from popular mobile devices. The BI solution from SAP allows users to make structured query language (SQL) queries of your relational database, which is then translated into raw data. Using ad-hoc reporting — reports created by hand in real time by analysts rather than software — users can request very specific data from their databases or data warehouse. SAP BusinessObjects also offers storyboarding capabilities. This allows users to outline their presentations of data visualizations in the same interface where the visualization was created. In addition to supporting filters for organizing visualizations, SAP’s storyboard interface allows users to add images and text boxes for titles and paragraphs. Users can create infographics by adding pictograms or shapes to their storyboards. Data visualization features from SAP offer charting suggestions and different types of animations for peak data representation. This BI software also supports geospatial integration with GIS sources like Esri GIS. QlikView BI supports data querying from a wide range of Big Data databases and repositories, which it caches for quick recall. Users of this solution can make unlimited ad-hoc queries, even if they aren’t data scientists with in-depth knowledge of data hierarchies. This BI software allows users to create storyboards to plan data presentations. QlikView visualizes the major steps it takes when users analyze the data so you can always find out what’s happening and why during data analysis. With QlikView, users can choose from a variety of pre-defined chart types for data visualization, as well as advanced animations. This solution also offers geospatial integration with GeoQlik, Qlik’s proprietary GIS system. With IBM Cognos, users can run visual queries through the Dynamic Query Analyzer. It presents data in interactive visual formats that allow users to run queries on them in real time. It supports geospatial integration with Esri Maps. Cognos offers storyboarding features that integrate interactive charts, graphs, live videos and more into visualization presentations. This function also provides a “pinning” option that lets users select widgets and pin them into the demand toolbar while exploring other data visualization dashboards. Once data has been analyzed, this solution suggests different charts and animations for ideal data representation. Oracle BI offers enterprise-level visualization functionalities. Users can select “recommended visualizations” and the system will provide custom guidance based on the nature of the data and the intent of the analysis. This way even the least data-savvy employee can create stunning data visualizations. This solution helps users glean data-driven insights through interactive data visualizations tailored to their specific needs and requirements. Oracle offers a customizable platform that can be made industry-specific, as well as other customizations for your individual needs. 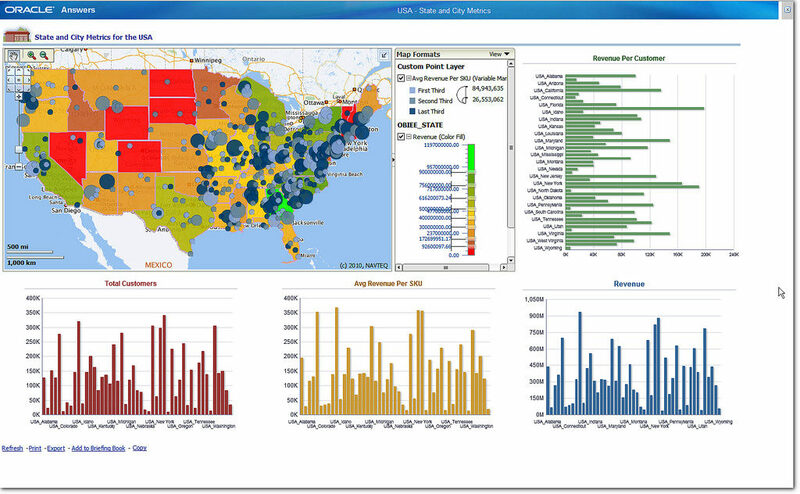 Sisense is a robust platform that offers interactive BI reports with customizable dashboards. It provides customizable interfaces to meet individual user’s needs. Sisense also offers automatic geocoding based on address data. Sisense BI automatically recommends charts or graphs that intuitively represent a specific data set. It also offers a unique feature that enables the same data points to be presented in multiple graphics for better understanding. Data visualization is a key function of all BI platforms, but some will provide better options for your company than others. To find the perfect BI solution for your organization, check out our BI visualization tools comparison report to see how individual solutions square up on different features. Make sure to look for a solution that offers data mining, custom dashboards, interactive reporting and location intelligence. Hopefully, our rundown of the best data visualization tools will point you in the right direction. Which ways do you need your data visualized? What solution did you choose? Let us know in the comments!